As Christian parents, we desire to raise faith-filled kids who stand strong for Christ among their secular culture. Along the way though, we end up getting off course. Distracted by other priorities, demands and tasks, we neglect the one thing that ensures we meet this goal: our foundation. The strength of your family is greatly determined by the foundation that you lay and build upon. A solid biblical foundation requires certain pillars. Fortunately, we don’t have to guess at what those pillars are, or try to figure it all out on our own. God’s Word gives us all that we need to teach and train the hearts of our children, build their faith, and point them to Him. How do you apply God’s word to your parenting and lay a strong foundation that will last a lifetime? 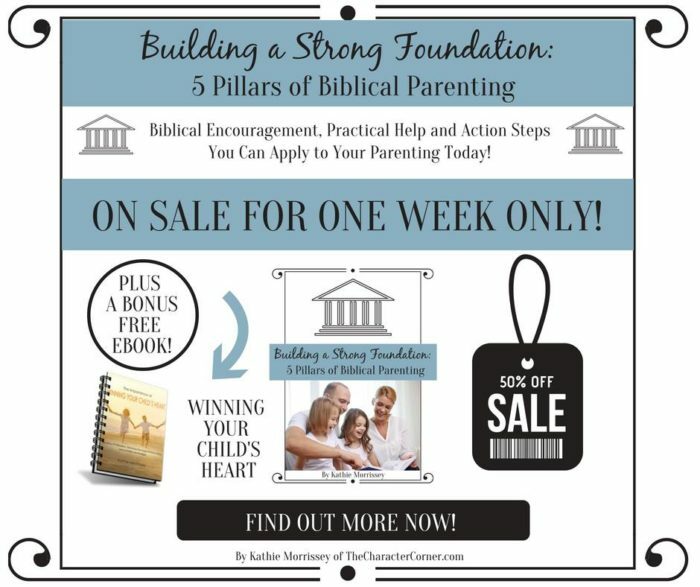 Kathie Morrissey of Character Corner breaks down these steps into manageable pieces in her 5 week video/workbook course Building A Strong Foundation: 5 Pillars of Biblical Parenting. I love that this course outlines concepts that will help you make small changes daily, in order to develop better habits with your children and train them in character! Kathie will walk you through God’s Word, focused on practical application in the most important areas in parenting. She encourages you to keep your eyes fixed on Jesus and reminds you that you are not alone in the battle for your child’s heart. Three aspects of faith to apply to your parenting, the importance of getting your children reading and loving God’s Word, as well as practical ways to build your child’s faith purposefully and consistently. The importance of building Godly character in your children, while covering the most common ways that character is learned. Practical instruction is given for setting up a plan to intentionally teach and train your kids in character daily, that includes several fun examples and ideas. Three character charts and an obedience chart are part of the appendix for this unit. The purpose of Biblical discipline, as well as the importance of going beyond correcting behavior to the heart issue. You will love the easy to use tips for training your child’s heart with Scripture! You will also learn how to take the frustration out of discipline, and see it as the opportunity that it is. Learn some common mistakes that hurt your relationship with your child, as well as get ideas of many simple things you can do to help build that relationship and win their heart so you have influence with them and can shape their values. Why it’s so important to pray for your children, ways to pray for them, and specific things you ought to pray for them. A beautiful prayer journal accompanies this unit to help you plan to pray regularly and consistently for each child. Special bonus offer for one week only, July 23-29, 2018! 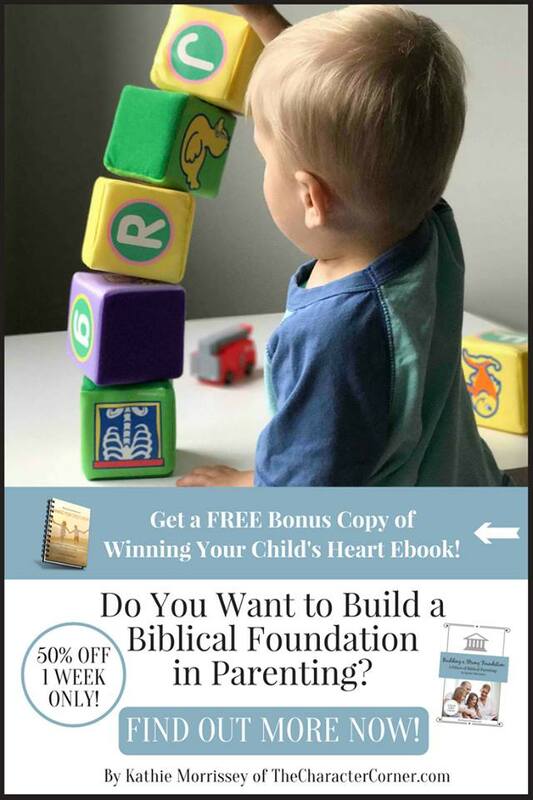 Grab your copy of Building a Strong Foundation: 5 Pillars of Biblical Parenting at 50% OFF and receive a copy of The Importance of Winning Your Child’s Heart ebook absolutely FREE! This course is a vital resource for any parent who wants the tools to building a strong, godly foundation for their children and winning their hearts.